Reverse Commutes Now Often A Daily Slog, Too In many places, the reverse commute from city homes to suburban jobs is as congested as or worse than traffic going into the city. "It's just exhausting," says one reverse commuter, whose 35-mile drive to Chicago's southwest suburbs can take up to two hours depending on traffic. In cities where reverse commutes are common, transit agencies are trying to help. 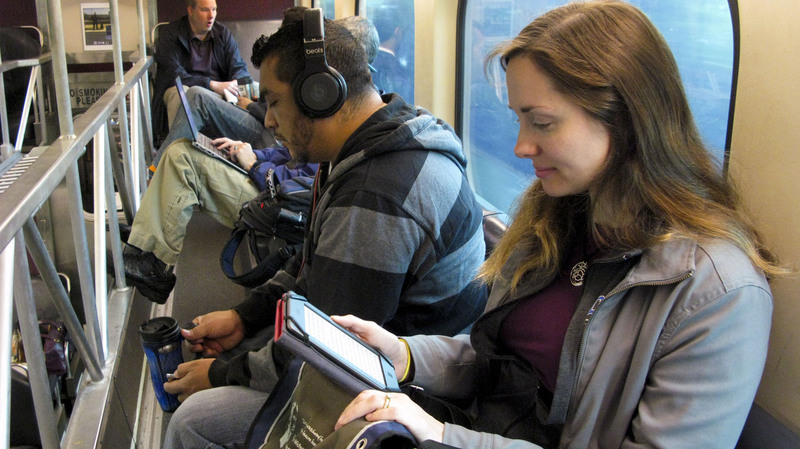 Kathy LeVeque reads her tablet on her reverse commute from her city home to her job in north suburban Deerfield. It is still as dark as night as Jim Rix steps out of his red brick Chicago bungalow and gets into his car, parked on the street. It's 6 a.m., and the 53-year-old engineer is getting an early start on his 35-mile commute out to Argonne National Laboratory in Chicago's southwest suburbs. "Depending upon weather and time of day, it can take 45 minutes to two hours to get to and from work," Rix says. It's just exhausting. There's nothing to be done with it, and the stress and so forth is pretty hard to take. Rix is one of many on the roads driving a reverse commute from the city to the suburbs. Over the past couple of decades, suburban job growth has exploded, but in recent years, there's also been a renaissance in urban living, especially among young professionals. The result: In some cities, traffic on the reverse commute is as congested as or worse than traffic going into the city. As Rix accelerates onto the expressway, traffic is already heavy, though moving — a good sign — but it's only because he leaves home so early that he's able to beat the worst of morning traffic. "Yesterday, for instance, I didn't leave until 7 o'clock; it took over 90 minutes to get to work and there wasn't anything particular going on." Crashes or bad weather can make the trip take much longer. "It's just exhausting. There's nothing to be done with it, and the stress and so forth is pretty hard to take," he says. So to avoid the worst of the traffic, Rix is one of a growing number of commuters working a flexible schedule: He gets to work early — around 7 a.m. Some days he heads home by 3 p.m.; other days, he stays at work until after 7 p.m., to miss the peak rush hours. 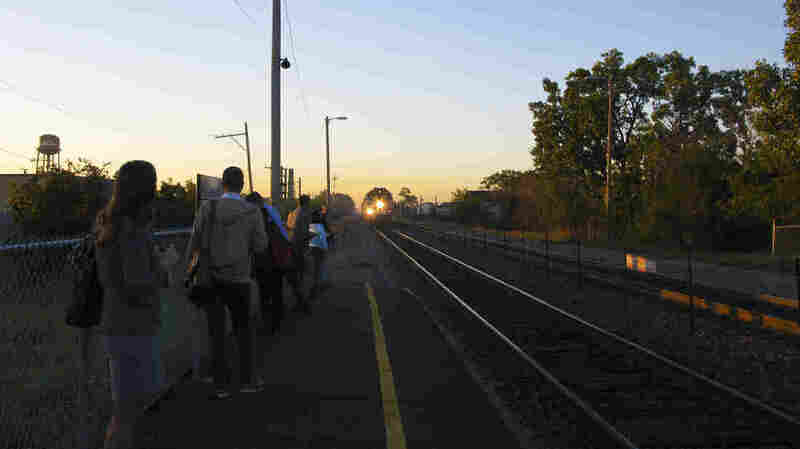 Reverse commuters, include Kathy LeVeque (in the foreground), wait for an approaching outbound Metra commuter train at the Mayfair neighborhood stop on Chicago's northwest side. Why not just move closer to his job? Jim's wife, Susan, has a long commute to a northern suburb in the opposite direction of Jim's. And Rix, who grew up in a small town in Iowa, just loves the culture and vibrancy of city living. That's what keeps Kathy LeVeque, 31, in Chicago, too. "I'm a city person," she says. LeVeque is waiting at a commuter rail station to catch a train to her job in north suburban Deerfield. As in other cities, Chicago's transit system was designed primarily to bring workers from outside the city downtown. But now, 70 percent of the region's jobs are outside that urban core. LeVeque herself used to drive nearly an hour or more each way every day. "It's frustrating to sit in traffic. It's time that's not your own," she says. "But when you're on the train, you can just relax, you can close your eyes, you can read a book." LeVeque is one of a growing number of Chicagoans making the reverse commute by train. In fact, train ridership on the reverse commute is up 64 percent over the past decade. To both ease her commute and still enjoy city life, LeVeque made a critical choice: "I actually decided to move to this neighborhood because I wanted to be off the Metra train to get to work, and then I wanted to be off the Blue Line so that I could get downtown easily." By doing that, LeVeque is part of another trend. Census figures show surging population growth along rail lines in Chicago, especially those leading to the suburbs. "It's an opportunity, but it also presents a big challenge for the transit market," says Leanne Redden, who oversees planning for the Regional Transportation Authority of Chicago. Redden says the challenge is getting reverse commuters the last couple of miles from suburban stations to the sprawling corporate campuses and office parks along the highways. One solution: the Shuttle Bug program. Big employers in one suburban corridor, including Walgreens and Allstate, help underwrite shuttle buses that take employees between their offices and the train stations. Redden is hoping to replicate the program in other areas. 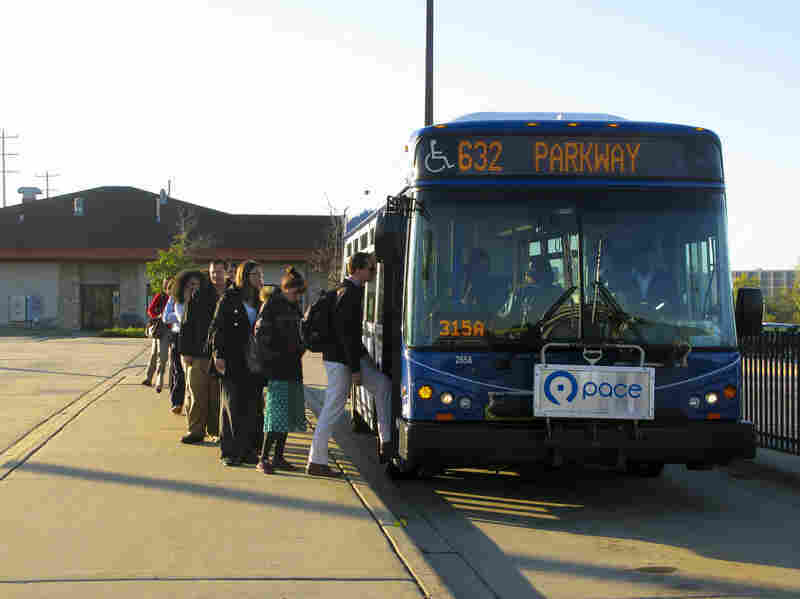 Other ideas to improve "last mile" connections could include express bus routes, more van pools and even car and bike sharing in the suburbs. "What we need to do is sort of piece those puzzle pieces together or provide those connections with flexible services," she says. But Redden acknowledges public transit can't be the solution for everyone's trip to the suburbs, and driving will continue to be the only option for commuters such as Rix, who takes a Zen-like approach. "It takes some time to just accept the fact that this is it, this is my commute," Rix says. There's no pushing traffic, Rix says, so he listens to some music, tries to relax and becomes numb to the long reverse commute.